O mind! Where is the further shore you're crossing to? there is neither stopping nor arriving. there is no boatman, no rower. there is neither this shore nor the further shore. There is no body, no mind. You won't find anything of your own in that emptiness. Be steadfast; sit within the earthen container of your body. Right there is where you should be. observe and think. Don't go anywhere else. Kabir says: Quit all distraction! Stay still, exactly as you are. jyom ke tyom Thaharai ho. 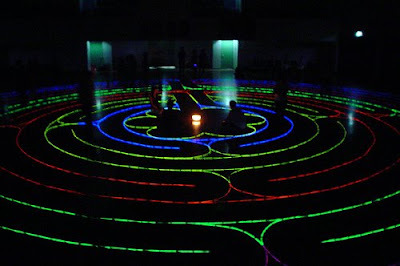 photo: labyrinth meditation at a school in singapore. organized by christian friends. in labyrinth walk meditation the center represents our return to Source and the maze our life and its complexities. it was an interesting experience. thanks Priya for taking me there!